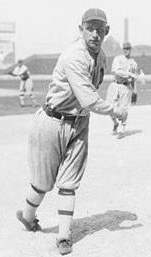 Frank Edward “Buck” Thrasher, an outfielder who played 30 games and batted .235 for the Philadelphia Athletics in 1916-17, an infamous period for manager-owner Connie Mack who sold off many of the players who had helped his team win four American League pennants and three World Series during a five-year stretch (1910-14). The A’s finished in eighth place during both of Thrasher’s seasons. Thrasher was another of those guys who hit well in the minor leagues, but got worse when the competition got better. He had been sold by the Norfolk Tars of the Virginia League to the New York Giants in 1915, but didn’t stick. Thrasher had batted .348 for the Tars, his fourth season in the minors and the fourth time he had hit well over .300. He played for the Atlanta Crackers of the Southern Association in 1916 and batted .337, then was sold to the Athletics. Thrasher attracted attention in a painful way early in 1917 when he was hit in the head by a pitch from Carl Mays of the Boston Red Sox. Mays had a reputation for throwing bean balls. Three years later a Mays’ pitch hit and killed Cleveland shortstop Ray Chapman in the only such fatality in major league history. Thrasher wasn’t seriously hurt by the Mays pitch, except that it probably became the strongest memory he had of his time in the majors, which came to an end soon after the incident. He finished out the 1917 season back in Atlanta, but for the first time in his minor league career failed to hit .300. He wound up with a batting average of .284, though he set a record that season by getting eight straight hits in a double-header, finishing the afternoon with a perfect day at the plate.